The ROM SmartCombi is Europe's most compact, lightweight and sharply priced design combi. The combined high pressure / vacuum pick-up unit is easily mountable on chassis (3,5 to 4,6 tons), twin axle trailer or open body truck. The durable design is extremely compact and manoeuvrable and therefore perfect for use in city centres and parking areas. The ROM SmartCombi equipped with a Speck high pressure pump. The vacuum system of the SmartCombi can be executed with a unique thrust jetter or a vacuum pump with maximum cleaning capacity of 200 bars and maximum water capacity 75l/min. Highly compact; length 2,75m., width 1,30m. & height 1,35m. Lightweight: from only 800 kg. The SmartCombi is especially designed for suction and jetting activities. 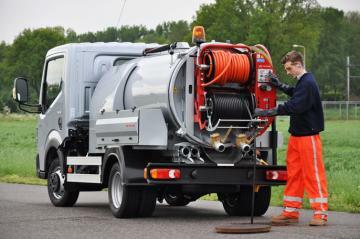 It is ideally suitable for the unblocking/cleaning of house connections and municipal sewers of up to Ø600mm. and the draining of flooded basements and grease traps. Dimensions (lxwxh): 2.750 x 1.300 x 1.350mm. Feel free to contact us if you want to know more about this product. We are pleased to tell you all about ROM SmartCombi (1500 litres).